This is not typical demo release. All tracks were planned to be included in cover songs album called "Verdandi", but this did not happen, due to technical problems (some of the original non-midi tracks has been lost, and some midi tracks damaged). So this demo includes some of the tracks that have been issued with MIDI sound format as a demo. A kind of "rehearsal work files". This demo its a first and last experiment with midi sound. 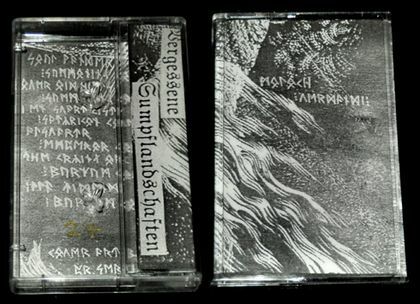 In 2008 German label Vergessene Sumpflandschaften Productions make a limited edition (40 copies only) tape release of this EP. Standart cassette with xeroxed one sided inlay (xerox was made from original handpainting and handwritten template). Copies 25,26,27,29,37 - not includes tracks 1&2. Also this copies includes tracks 3-6 in remastered version with new sound (rehearsal versions of the tracks with real keyboards), instead old original midi tracks. 15 copies of this release were destroyed through the fire in rehearsal room. Only 25 copies are circulated.